This fall, when she heads off to the University of Georgia, Bleckley County High School senior Jordan Barker is taking along something extra – nearly 40 hours of college credit. That’s roughly a year and a half of college she’s already completed at Middle Georgia State University (MGA) through Move on When Ready, the state’s dual-enrollment program for qualified high school students. Barker is one of nearly 485 high school students currently enrolled at Middle Georgia State through Move on When Ready (MOWR). The dual-enrollment program allows students to earn college credit while simultaneously completing their high school diplomas. Through the Georgia Student Finance Commission, MOWR covers tuition, textbooks and nearly all fees, so students and their parents pay almost nothing. The program, which previously funded fall and spring semesters only, recently expanded to pay for eligible high school students to take college courses during summer terms. Middle Georgia State is an attractive option for the region’s high school students who want to take part in Move on When Ready. MGA’s dual enrollment ranks in the top three of the state’s comprehensive universities. Barker, the Bleckley County High senior, has taken most of her MOWR classes on the Cochran Campus. This semester, her last before graduating high school, she is taking Biology, American Government and American History to 1865. Evan Bloodworth, 17, a senior at Warner Robins High School, also took classes on MGA’s Cochran Campus when he was part of the Georgia Academy, Middle Georgia State’s residential program for dual-enrollment students. A desire to live at home prompted his switch to becoming a commuter MOWR student, and he now takes Middle Georgia State classes online after completing some courses at the Warner Robins Campus. When he graduates from Warner Robins High this spring, he will have about two years worth of college credit. Bloodworth plans to continue at MGA this fall – he’ll enter as a junior - to complete a bachelor’s degree in Biology, followed by medical school. De’Yana Hines, 18, a Dublin High School senior, also enjoys the flexibility as she takes classes on MGA’s Dublin and Cochran campuses. This semester she is taking Physics and Algebra in Cochran, Psychology in Dublin and Intro to Information Technology online. “I love being able to make my own schedule,” said Hines, who plans to attend Mercer University in the fall to major in biomedical engineering. She’ll have 24 hours of college credit going in, thanks to MOWR. A Hawkinsville High School senior, Ana Kilgore, will have 38 hours of college credit when she graduates this spring. She took her classes online and at the Cochran Campus. One of MGA's youngest dual-enrollment students, 15-year-old Laurel Sparks, is a sophomore at Mary Persons High School in Forsyth. She is taking all of her MOWR classes online this semester and plans to take courses on the Macon Campus in the coming months. "Despite your age, you are still treated like a college student and you are expected to act like one," said Sparks, who hopes to attend UGA for a double major in Music Therapy and Art Therapy. "That is something I really appreciate. MOWR classes have allowed me to grow so much as a student." Dual-enrolled students can continue to take part in activities at their high schools, and many who attend Middle Georgia State do just that. Bloodworth said he still attends pep rallies at Warner Robins High, while Barker plays on Bleckley County High’s tennis team. Hines remains active at Dublin High, where she is in the Beta Club and Future Business Leaders of America chapter. She’s also part of the Dublin City Youth Council. Many high school students get their Move on When Ready start by taking a class or two during the summer semester. High school students who want to explore taking a class at Middle Georgia State this summer can call 478-471-2725 or email admissions@mga.edu. More info is at www.mga.edu/admissions/MOWR. 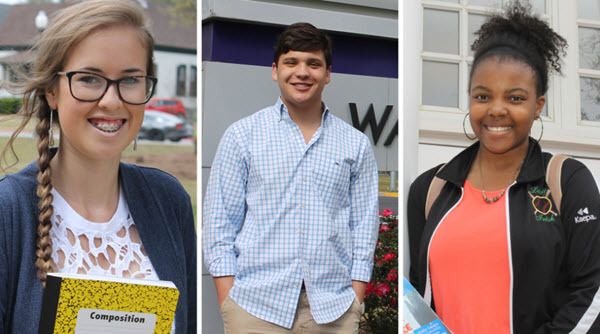 Photo collage, left to right: Jordan Barker, Bleckley High senior; Evan Bloodworth, Warner Robins High senior; and De’Yana Hines, Dublin High senior, are among the 485 high school students currently taking courses at Middle Georgia State University.